Not long ago we received a call from a customer looking for purchase some of our leather straps for a special project he was working on. Intrigued to learn more we asked him to share the details of his project, and we ended up finding an awesome new artist to watch! Michael Goettee has just the kind of creative perspective that we love to see. His art is saturated with Southwest flavor and, frequently, a bit of humor as well. Plus, taking a look at his work got us more geared up than ever for the Wild Wild West Steampunk Convention happening in March! He does a lot of painting—mostly in rich acrylics—along with other sculptures, and quite a bit of mixed-media work as well. His website features a collection he calls the Wild West Picture Show full of paintings and mixed-media pieces each offering their own little snapshot of the Southwest. Some influenced by subjects that are Spanish, or Native American, or Route-66-sight-seeing-American. Some wild west historical, and some fantasy. He wrote recently on his blog that a particular piece of work was inspired by the old Roadrunner and Coyote cartoons, and that piece happens to the be the one he picked up our leather straps for. The Acme Rocket-Powered Skates seem guaranteed to let Wile E Coyote catch the roadrunner. 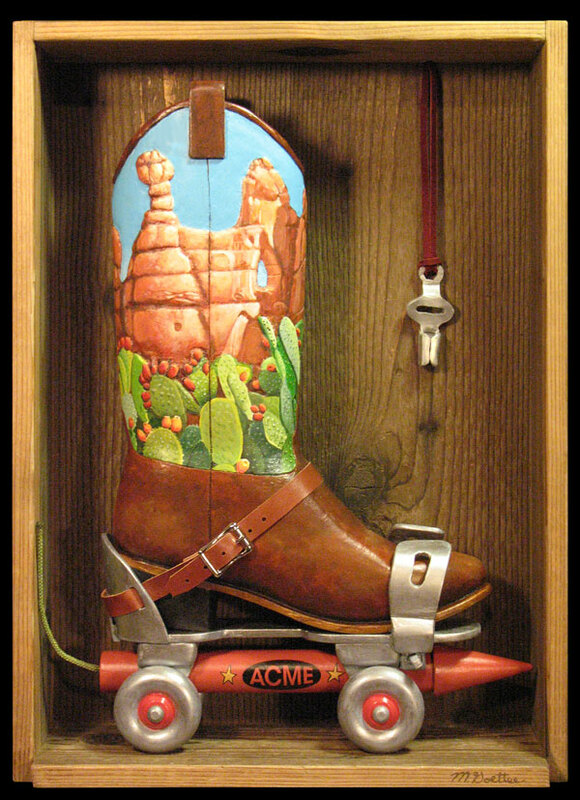 The boot is strapped to the skate with Steampunk Goggles’ DIY Leather Strap and Buckle, and is painted with a prickly pair and desert rock landscape that you can imagine the chase scene going down in. This particular skate is still in its ACME crate and appears unused, however, so we aren’t any closer to knowing if Wile E ever did catch that Roadrunner. The Landscapes and Skyscapes, Michael Goettee paints, are captivating in their own right. 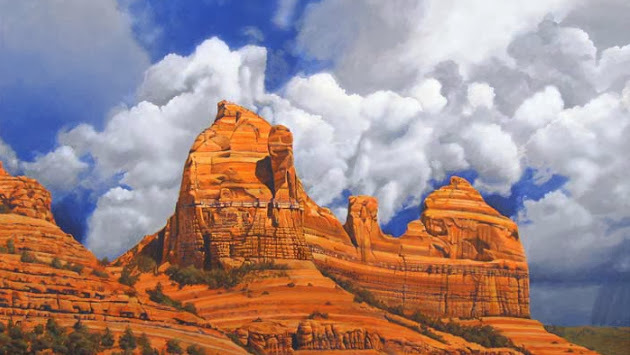 Capturing the Southwest in the right season, he depicts green vegetation, the blue sky, and the orange rock formations with a palate that might seem more appropriate to a dream landscape. Those who are familiar with the landscape of the American Southwest will be transported back by his Earth Sky Dance series, and others may find themselves longing for the day they can see it for themselves. So if you need a little inspiration for your Steampunk Wild Wild West Convention costume, or you’re simply as into creative art as we are, you can check out more of Goettee’s work on his site MichaelGoettee.com. And don’t forget to check back soon for a post on costume ideas for the Wild West Convention, happening March 6-8th!